The humpback whales were believed that they had been extinct, but they started to be found about 15 years ago in the ocean around Zamami island. 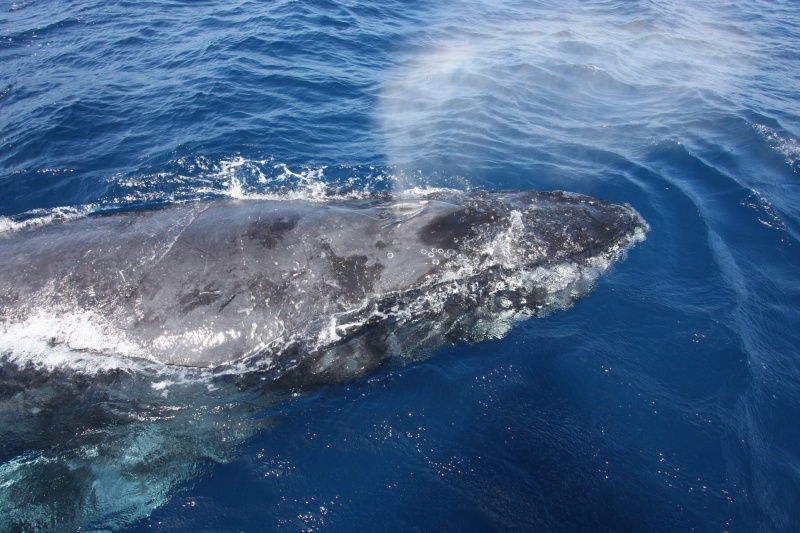 As the number of seeing whales increasing, we hope the Okinawan ocean is going to be the breeding grounds for humpback whales, and we operate whale watching every year. This ship has debuted in May 2004. The ship is 53 ft, for 30-passangers, and 2-stair decks. You can also relax on the ship. You can shelter from rain and wind. 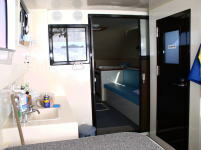 It also has rest room, so you can fully enjoy whale watching! 1st deck. You will see the cabin. The whales come close to our ship sometimes. If you are on day trip, please refer the following schedule. 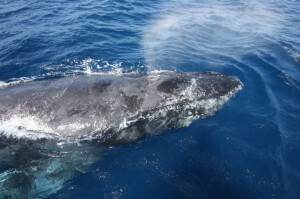 ・Depends on the weather and whales’ occurrence distribution, we leave the port in the afternoon. Arrive Zamami Port. Our staff is waiting at the port. Move to the point where the whales are. Start whale watching as soon as we get the point. So powerful!! 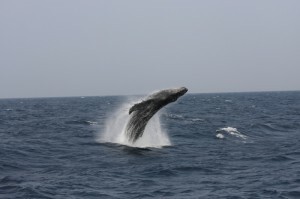 Enjoy the humpback whales’ dynamic actions. Finish whale watching. Return to the port. If you have more time, you can take a walk, relaxing at the beach etc. Departure from Zamami Port to Naha by Queen Zamami (liner) . Anyone can perticipate in whale watching, but please understand the following advices becuase we watch wild animal in natural environment. 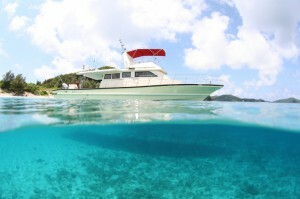 The sailing can be canceled due to bad weather and sea condition. Please make your plan with plenty of time. 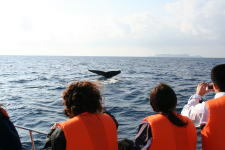 For example, you visit Zamami island with day trip, please make reservation during early period of staying in Okinawa. You can re-schedule your plan to next day if it’s bad weather and sea condition on the day you reserved. If you want to verious kinds of whales’ actions, we recommend you to try several times. 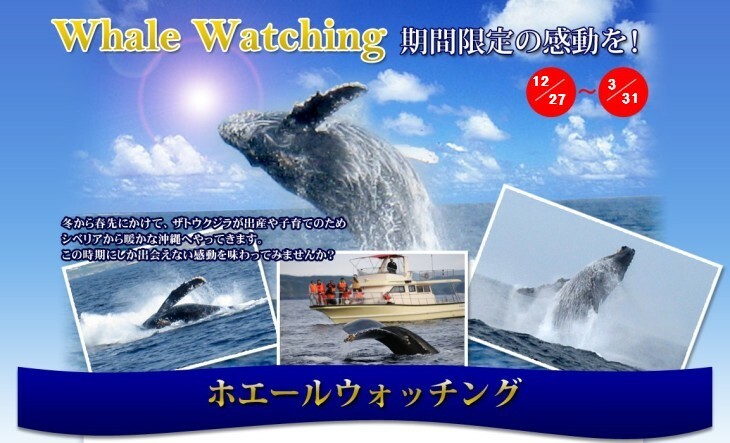 ★Please perticipate in whale watching with suitable clothes. During transportation and whale watching, the ship can’t be steady. Please perticipate with clothes that you can move easily. We don’t recomment skirt and high-heel because they may cause accident during on board. Even Okinawa has sub-tropical climate, it get chilly on-season. Please don’t forget to bring some jackets. People sometimes take a dip on the ship. It’s convenient if you bring water-proof jacket or raincoat. Please prepare medicine to preve mortion sickness. If you are on day trip, we recommend to take medicine before you board to Queen Zamami. 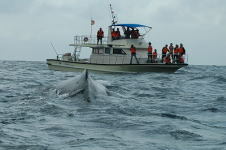 The lack of sleep and too much drinking can cause seasickness, please take sufficient rest day before whale watching. Each whale has each charactor and act differently as we, human begings, have different charactors. We can’t prospect when, where, which whales, and what kind of action we can see. We encounter wild animal in natural environment. Please be aware that it’s not guarantee to meed the whales. You will be more impressed when you are able to see the whales beyond those information.